May 21, 2016 - Twenty four NAVC Coaches attended the Art of Coaching Seminar two day clinic held at Georgia Tech May 21-22. The Art of Coaching Volleyball story begins with three friends, all of them exceptional coaches, all of them lifelong students of volleyball, all of them possessing a strong desire to teach the game they love to anyone who shares their passion.Russ Rose, John Dunning and Terry Liskevych met in the 1970s. Terry and Russ connected first – in 1973, when Russ signed up for a volleyball class taught by Terry at George Williams College in Illinois. Terry was also the assistant coach for the school’s men’s volleyball team under head coach Jim Coleman. At the urging of both Terry and Jim, Russ joined the volleyball team and, as the saying goes, caught the bug. Long story short, Russ stuck around long term. Today, as head coach of the women’s team at Penn State, he has more wins (1,161) and titles (7) than any other women’s coach in the history of Division 1 volleyball. It was 1977 when John met Terry. At the time, John was a math teacher and a basketball coach at Fremont High in the San Francisco Bay Area. He was asked to coach the volleyball team. He knew very little about volleyball, but he agreed to take the job. That summer, he drove to Stockton, California, to take a clinic from Terry, who by then was head coach of the University of Pacific women’s team. To save money, John slept in his car. In the coming years, John and Terry became good friends and frequently swapped volleyball stories and strategies. 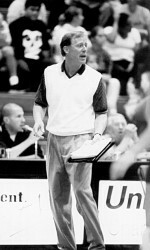 John, who founded a volleyball club in the Bay Area, succeeded Terry as the head coach at UOP in 1985 after Terry was hired to coach the USA women’s national team. It was a smooth handoff. Terry had taken UOP to 5 final fours, including his final 2 seasons — 1983 and ’84. John took over and promptly won consecutive NCAA championships in 1985 and ’86. Since then, John has won 2 more national titles as head coach at Stanford, a job he took in 2001. After coaching the U.S. team in 3 Olympics (including the bronze-medal winners at Barcelona in 1992), Terry reentered the college game in 2005 as head women’s coach at Oregon State. Not long after, he, Russ and John began talking about an idea they all wanted to pursue: clinics for coaches. Their primary mission was to share knowledge they’d acquired over decades of teaching the game but to emphasize that there are many ways to be a good coach. Promoting a one-size-fits-all philosophy didn’t interest them. From their perspective, there’s lots of room in volleyball for creativity and individuality and tinkering and, yes, even disagreement. So The Art of Coaching Volleyball was built to produce a steady flow of good ideas from expert sources in the hope that each coach will use that information to chart his or her own path. To that end, Art of Coaching launched an annual series of coaching clinics in 2011 and later created a website where coaches could find the resources they need to help their players and teams improve. Drills, tactics, techniques, philosophies, fitness tips, nutritional advice, mental training – it’s all here at TheArtofCoachingVolleyball.com. And it not only draws from the collective data bank of Russ, John and Terry, it includes valuable input from numerous coaches across the country who have mentored players at every level and every age. At The Art of Coaching Volleyball, our unwavering commitment to you is to offer the tools necessary for you to be an outstanding coach who values listening and learning and seeks to evolve. If you’re a better coach today than you were yesterday, we’ve done our job, and so have you.